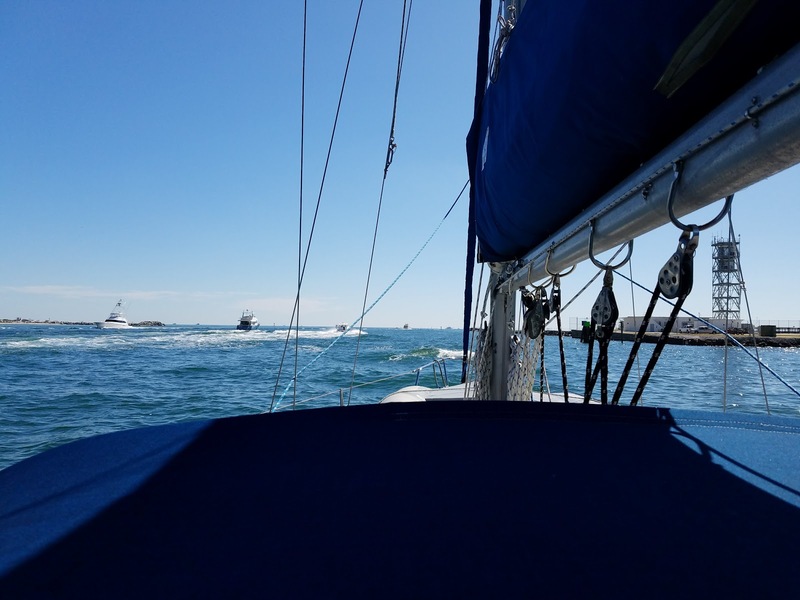 We motored down to Port Everglades Friday morning and tried sailing up to Hillsboro Inlet, but the wind was somewhere else, the sea was calm, and the motor ran smooth! Peggy smiling as we left Port Everglades. See that big ship astern? We did, and we kept to the South side of the channel just to keep out of it's way. The flag tells a lot! It's drooping! I shook out the reef shortly after exiting the channel. Didn't make a difference, we were motoring at idle and the wind was on the nose a knot faster than our speed. We were creating more of the wind. But it was a beautiful day to be out on the Ocean. We stayed pretty close to shore all the way up to Hillsboro Inlet. The HI bouy has been replaced - finally - after getting dragged ashore during Hurricane Irma last year. As we navigated into HI, we saw the depth drop down to below 5' In theory we were aground, but the bottom was really soft and we barely felt a thing, perhaps our depth was being impacted by the turbid waters. After a few doughnuts we passed under HI bridge and headed North, easily making the bridge opening and then 20 mins on to Camino Real Bridge, barely had to wait. I had proofed Bread overnight and baked it Saturday Morning, two loaves so we gave one to Pam & Dave. Baked in our New Non-Stick bread pans from Sur La Table in Coconut Creek. 1st attempt at cooking two loaves at the same time. Very pleased. By Saturday afternoon, the Host boats were rafted up - Sjöfn, Eximius, Lizzetta and Into the Blue. Moonlight, My Sanity, Rabbit, and Time to Go, but I'm pretty sure there was a couple more boats! Around 5pm, crews started to arrive, bringing food, drinks, deserts, drinks, Shepherds Pie (Thanks Janet - Delicious!) Brisket, and if you consider that we had about 10lb of Corned Beef, and loaves of Soda Bread (Winn Dixie) and Rum aboard - it was a party! After the crowd ate most of the food, drank most of the bear, and the Rum, it was time for our Party Games. We started with the Trivia Contest - it's complex - hey, it's my job to confuse! Here you see some of the participants trying to answer a question using a direction. It was, as expected, the drinks and questions ensured that. Tom managed the Sailing Limerick contest and Pat & Dave selected the winner of the Best Irish Costume, well done Vicky! The coin toss was a challenge when held on the 4 mono hulls, but it worked and several earned extra bottles of whiskey. Most made it but Jeff Miskin and his crew seemed to get lost in the 200 yard trip from the host boats to the raft up of Diversion, Hi Nina and Chesshire (see those 3 power boats in the background of the pic above - they were Wey Hey'd over there. The weather was perfect all weekend. Saturday morning we prepared breakfast for any that were up. We had plenty of coffee, ton's of muffins, and some brought more food! Tom noticed that I had Grand Mariner on my boat and asked for some with his coffee - I obliged, but only after he passed his coffee mug, I was not going to let my bottle of GM get off my boat! We had a blast, everyone seemed to enjoy themselves. After breakfast we learned that Hillsboro Blvd Bridge had a problem and was Locked down - sailboats could not pass! That meant wait till the bridge was fixed or go out through Boca Inlet. We have never gone out of the inlet, it's risky, but boats with greater draft than our 5'7" have done it. It's just not worth the risk for us. So we opted to wait for the bridge to be fixed. It didn't take long but several boats still went out via Boca Inlet. Oh, nearly forgot! 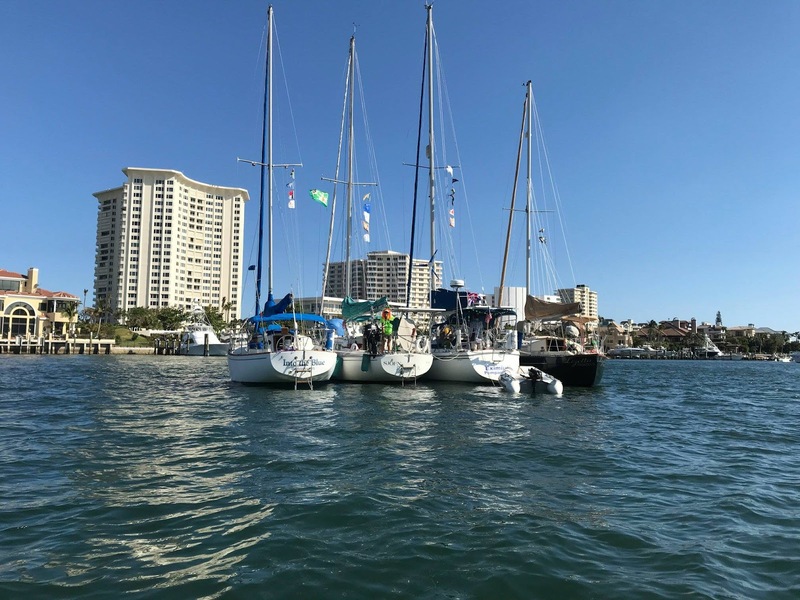 Friday afternoon, a commercial Catamaran got wedged on the rocks outside of the Boca Inlet Bridge which created a bit of a stir. Several tow boats went to their aid and successfully pulled the boat and the bunch of guests aboard. Back to Sunday morning after breakfast. We were the last ones to leave the host raft up. It took a few minutes to untangle the anchor chains, but no sweat. We hoisted our anchor, turned to the North end of the lake and called Camino Real Bridge making the Noon Opening. At the Hillsboro Inlet bridge there was a dozen boats waiting to go out, we dropped back to let them go and easily ran out of the Inlet. Once out, we turned back into wind and hoisted the Main, turned South and unfurled the Jib, no reefs in at this time and No wind either. So we furled the Jib and motored down about 1/2 to 3/4 nm off shore. We saw Sjöfn flying her Genneker about a 1/2 mile further out, sure looked good! I hailed Dave on 16 and switched to 68. Dave had left before us and had gone out of Boca Inlet, we knew it was Sjöfn because we could see the Red Dragon on her sail! How do you spell ENVY? 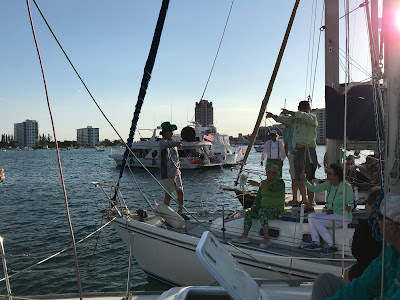 Our motor down to Port Everglades was uneventful, but when we turned to go North towards the 17th Street Causeway Bridge, there was a flotilla of vessels waiting for the bridge to open, we motored past them and wondered how many were thinking - They'll never get under that bridge! We had about 6' to spare. Within a few minutes of us passing, safely, under the bridge, it opened and the flotilla began to head through, I don't think we have ever seen the ICW that busy, it was like I95 for a while. Travelling from Lake Boca down to Port Everglades on the outside is so much nicer than racing to the next bridge (Six of them) especially on a calm day like today. Sticking to the ICW, we peeled off South into the Lake Sylvia entrance, skinny water at low tide, but we stayed deep enough and anchored in the North West corner with 60' of rode. 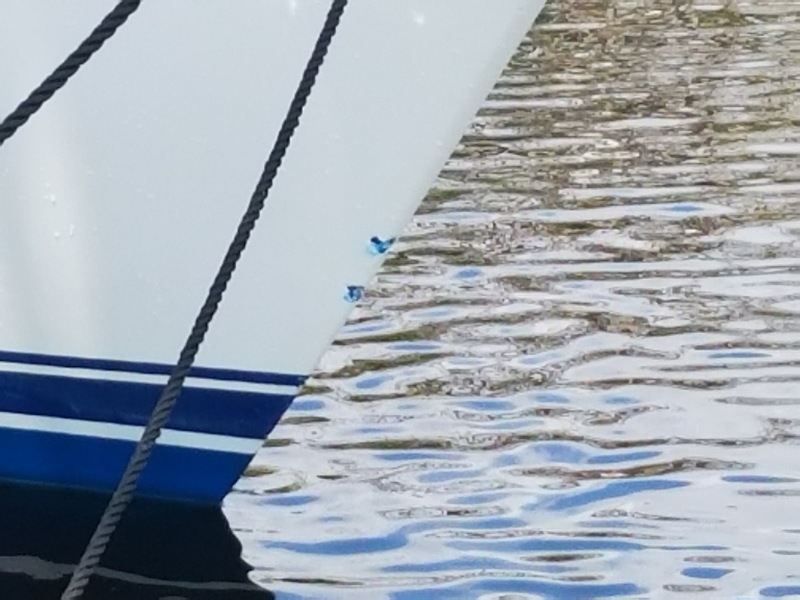 A nearby vessel expressed concern that we were too close, and I decided after watching the swing and learning that he had 90' of rode out that it would be prudent to re-anchor. So we pulled anchor and headed over to the South East end of the lake. An easy anchor and we secured for the day. Time for a late lunch of Cheese, Grapes, the bread I had baked on Saturday and a glass of wine. Then a 60 minute snooze! I made a bit of progress on the installation of our Dry Bilge system. Figured out the best location for the discharge vent, just below the Aft Water Tank Discharge fitting. Of course, the new vent will make the old one (30 years old) show it's age. I realized that I'll have to get a hose fitting that will convert the 5/8" barbed end down to the 3/8" hose that will connect the vent to the pump. We opted for just a snack instead of Dinner, and solved many of the world problems, or at least recognized they were beyond resolution. 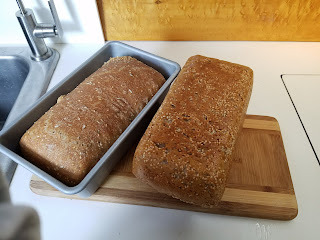 I browsed Facebook to view the pics that club members had posted and read the comments that members of the Cooking on Boats page had made about my bread. Pierre (Charity) noted that he avoids Gluten, so I'll have to plan on a Gluten free bread for when they come along side. Sylvia Lake on Monday morning was like Glass! not a ripple! There were about 23 boats on the lake, most of them well cared for, a couple that are junk and give the rest of us a bad name. Don't get me wrong, after all, our boat is 31 years old now, it's not the same high gloss it was back in 1987 but we maintain the boat and keep her in good condition, it can always be improved. But the Junk boats are wrecks - canvas draping over the sides of the boat, no engine, mast laid down, what used to be a fender hanging in the water over the side. If it were on land it would be condemned. 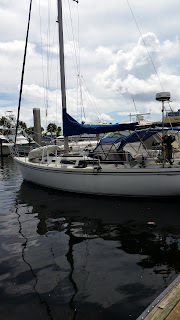 We stirred a few ripples as I pulled up the anchor, my morning exercise, and Peggy motored us clockwise around the lake and out of the channel and into the ICW where we turned to Port and started up the New River. Our plan was to stop at the Pump out station just downstream of the Third Avenue Bridge. Last time we had to deal with some pretty strong current, so we were prepared this time just in case. I had the lines ready and we approached the dock astern of Musette and made a perfect docking. I stepped off the boat that was barely touching the dock pilings and not moving at all. Good Job Peggy! Then a City Employee called out that we had to leave the dock immediately! Apparently another vessel had 'reserved' the dock for using the pump out, and they were just passing under 3rd Avenue bridge, he demanded that we get off the dock. Dang! At least, that's the publishable word I can use that describes my frame of mind. My military training kicked in and accepted the command and calmed Peggy down before we moved off the dock back into the river. As we pulled out, we could see a bunch of other boats waiting on the bridge opening, but 3rd avenue bridge opens really quickly and they were waiting far too long. We were getting pushed around by the current from behind and from the wind out of the North East, and hindered from movements by the vessels ahead of us. I made the command decision to tie up along side on the East side of the river where there was a gap between other docked boats. 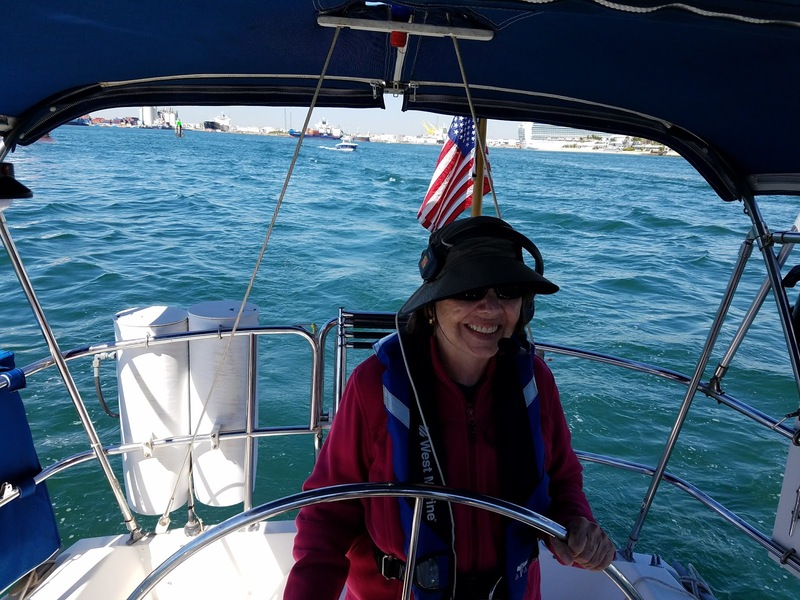 Peggy took the helm, but the current was much stronger than either of us thought. 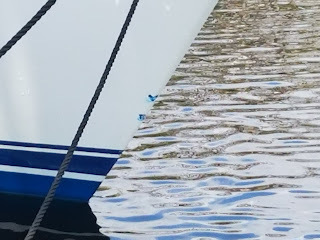 The current pushed our stern up river and we hit out bow on the concrete dockside, my fault, it was a bad decision to try and dock on that side of the river. Now we have a scarred bow that needs some TLC. I went back to the helm and was able to get us motoring astern to get away from the dock and back to the middle of the river. Once safe, I contacted the vessel ahead of us and asked his intentions. He radioed back that they were waiting on a 110' Yacht outbound, so I held station astern of her. It was not easy, it took a lot of concentration, quick decisions to deal with both the wind and current while staying away from the very unfriendly dock on the right (while going upstream) side of the river. Of course, all of this was while I was internally trying to ignore that I had dinged the boat! But that's what you have to do, get over it and deal with the current (no pun intended) issue. The big yacht come through 3rd avenue bridge and the vessel ahead of us started to make way under the bridge (I say Under, but it's really 'Through' as the bridge is open). I called Andrews Avenue Bridge requesting to follow the vessel ahead of us through the bridge, but then realized that the FEC Railroad bridge was closing! Wow! That's Fantastic! (WTF) There's very little room between Andrews and the FEC bridge, and the vessel ahead of us would be stopped while we try to keep station in the not so nice conditions. I called Andrews and advised that we would cancel out passing due to the FEC bridge being down. But the Bridge Tender at Andrews responded that I should proceed as the FEC Bridge was closed for maintenance but was opening for our passage (and the vessel ahead of us) So I confirmed and throttled up to get up to speed in order to follow the boat ahead of us. We passed both Andrews and the FEC bridge. Next it was 7th Avenue Bridge, and as we got around Sailboat Bend the bridge was already open and we motored through. The yacht ahead of us came to a stop just south of the Fork in the New River, they confirmed it was ok for me to pass on their starboard side as they were waiting on another vessel coming out of the South Fork and we were heading up the North Fork. Other than Peggy and I having a few words about the Crunch incident, we continued quietly up to our dock and, again, Peggy made a perfect docking. 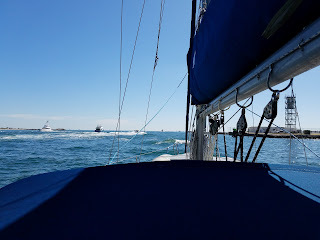 The wind from dead ahead (West) which could hinder our turning the boat so that it faced back down to the open end of the channel, but I had a line setup on the Starboard side midships cleat, then forward and back to the Port side where I stepped off onto the dock. Securing the turning line, I walked the bow off the dock and to the East. As the bow neared the end piling of the dock, I picked up the bow lines and put them on the cleat on the fore deck. Back to the turning line on the other end of the dock, I easily pulled the stern of the boat around and along side the dock. Despite the crunch, which is not a disaster, we had a great weekend and as always - learned a lot.